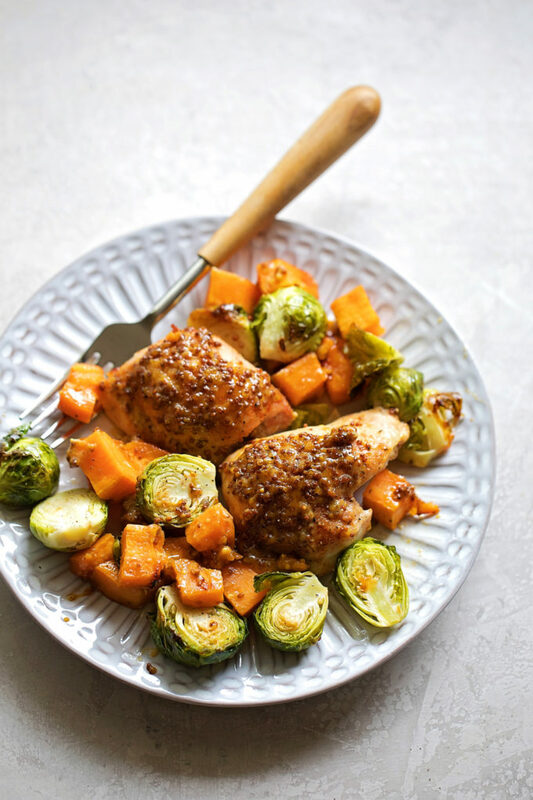 Sweet and tangy maple dijon roasted chicken and veggies. 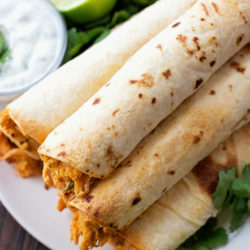 Made in a cast iron skillet and cooked in the oven until tender and golden brown. I’m not sure why we don’t do these dinners more often. They are so simple! Rest assured that there will be more of this coming to the blog soon! 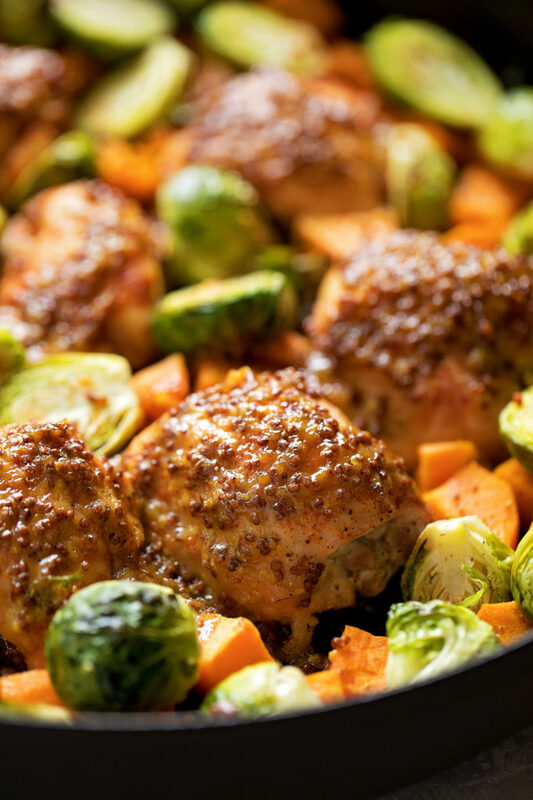 This roasted chicken and veggie skillet is absolutely perfect for fall. 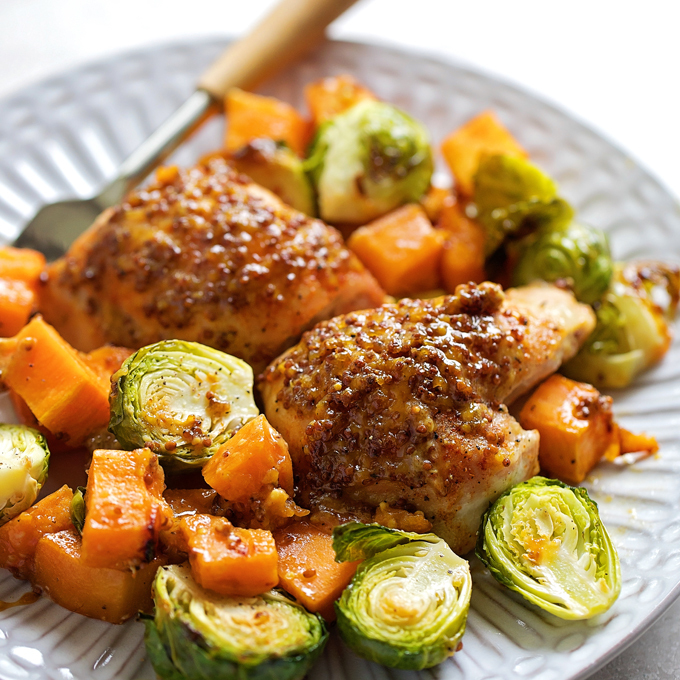 It only requires three staple ingredients: chicken, sweet potatoes and brussels sprouts. The rest of the ingredients are all things you can find in your pantry or refrigerator (with the exception of the mustards, you may or may not have those). Grab a large, well-seasoned cast iron skillet or a Dutch oven and you’re good to go! I like to rub just a tad bit of oil in the bottom before I put the chicken into it, just to prevent anything from sticking and to help give the veggies a nice golden brown crust on them. What kind of oil should I use to season my cast iron skillet? Use a paper towel to carefully coat the bottom of the pan with a thin layer of oil. Place the boneless skinless chicken things into the pan, then make the sauce. For the sauce whisk together dijon mustard, whole grain mustard, quality pure maple syrup, apple cider vinegar, and coarse kosher sea salt. 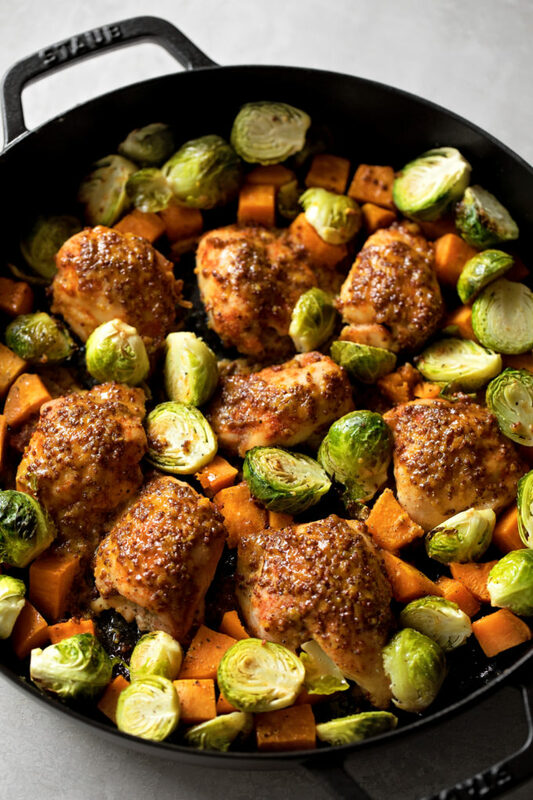 Spoon the 1/3 of the mixture over the chicken, then place in the oven and cook at 425 degrees for 10 minutes. Add the sweet potatoes, use another 1/3 of the sauce, then return to the oven. After another 10 minutes add the brussels sprouts and pour the remaining sauce over top. It will seep below the chicken, into the veggies and caramelize as it finishes cooking. 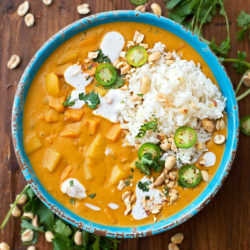 You can serve this dish as-is or alongside rice pilaf, cous cous, or quinoa. No matter what you serve it with, I guarantee everyone will want to lick their plates clean! This is one you’ll make time and time again! Sweet, tangy, sticky and absolutely delicious!! What’s your favorite thing to make in a cast iron skillet? Leave a comment below and let me know! Spread the oil on the bottom of a large cast iron skillet or Dutch oven. Add the chicken and season with paprika. 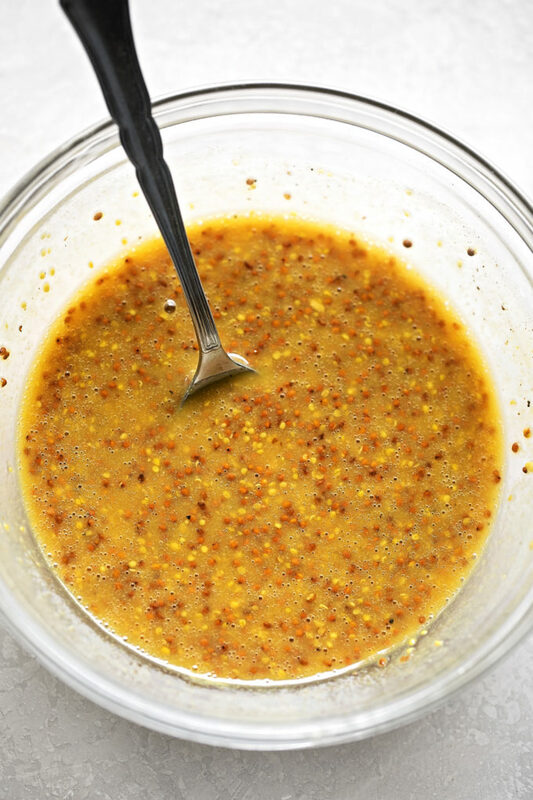 In a medium bowl, whisk together the mustards, maple syrup, vinegar, and salt. Spoon 1/3 of the sauce over the chicken thighs. 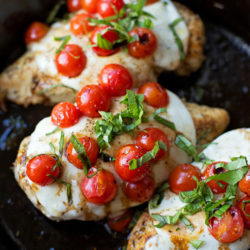 Place chicken in the oven and bake for 10 minutes. 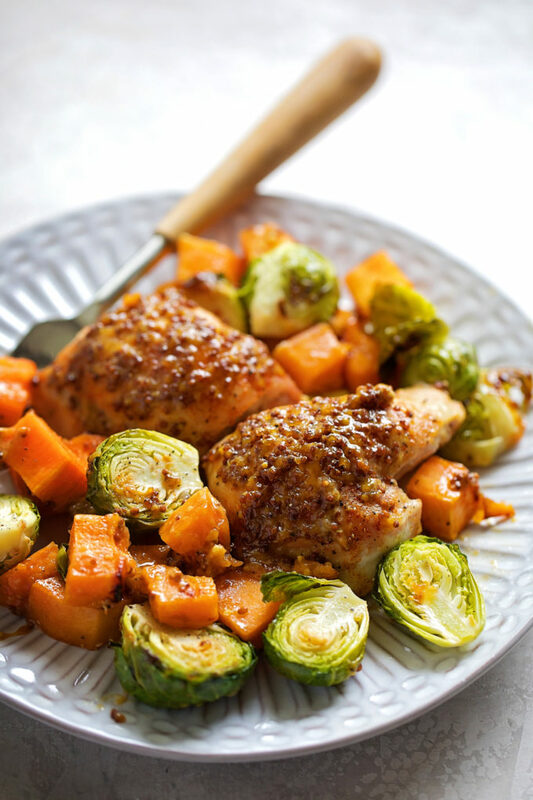 Remove the skillet from the oven and spoon half of the remaining sauce over top, add the sweet potatoes. Return the skillet to the oven and continue baking for 10 minutes. Remove the skillet from the oven and spoon remaining sauce over top. Add the brussels sprouts. Return the skillet to the oven and continue baking for 20 minutes or until the potatoes and brussels sprouts are fork-tender. Thanks Emma, I hope you will! Would it be possible to substitute honey for the maple syrup? I never buy maple syrup, but I always have honey on hand. I haven’t tried this recipe with honey, so I can’t really say for sure. I would maybe use a little less than what the recipe calls for (maple syrup).